Is Jimmy Vesey Being Improperly Shamed? It’s a tough decision collegiate players face when deciding their NHL future. It’s made even worse when their rights are owned by an NHL club that they chose not to play for. Yet, we’ve seen a lot of it lately. Guys like Justin Schultz, Mike Reilly and now Jimmy Vesey have all passed on playing with the teams that drafted them – choosing to instead sign somewhere else. While I – along with a number of others don’t necessarily agree with the process – the choice isn’t one that these players should be ridiculed for publicly. The rule is in place in the NHL’s collective bargaining agreement (CBA) that gives these players the opportunity to sign elsewhere. Who are we to call them out on it? Well, the Nashville Predators have publicly voiced their disappointment in Vesey’s decision not to sign with them – and with good reason. But the fans aren’t so kind with their words and some have taken their frustrations to social media. But as Ryan Kennedy writes in his column at The Hockey News, Vesey’s well within his rights to hit the free agent market and leave Nashville fans disappointed. After all, like the politicians of the world, GMs have been known to make false promises to player as well. While David Poile and the Preds offered Vesey top-six minutes and the chance at playoff hockey at the NHL level right away, the kid decided against it for whatever reason in favour of deciding where he’ll start his pro career. 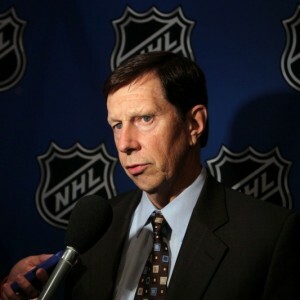 And in no way am I saying that Poile and the Preds are lying – or falsifying promises. But what would happen if Vesey joined Nashville for their playoff push and didn’t fit in right away? Would his remain a top-six forward seeing 15 to 20 minutes per game? Likely not. So the saga continues. Vesey’s gone (for now) and the Predators are left without that 22-year-old scorer they were hoping to have for the start of the 2016-17 season. And yet, Vesey did nothing wrong. It’s not an unwritten rule – in fact, it’s written clear as day that draftees do have an eventual way out from where they are drafted (though it differs slightly for non-collegiate players). So what’s next for the Preds? On Jimmy Vesey, I understand David Poile's frustration, but this is like Tim Murray complaining about the lottery. The rules are there. Luke Fox at Sportsnet takes it one step further, quoting Nashville’s assistant GM – Paul Fenton – in regards to the Vesey situation. The problem? You’ve put a 22-year-old on the spot, resting your future plans on his decision. And maybe – just maybe – at the time Vesey wanted to play for Nashville. Maybe suiting up next to guys like Ryan Johansen and Shea Weber seemed like the best opportunity. But the Preds made one mistake. They based their deadline plans on the word of an unsigned collegiate player and sometimes things change. However, as ESPN’s Joe MacDonald reports, there never really was any sort of commitment from the Harvard forward. In fact, MacDonald’s source says that his decision was made quite clear prior to the trade deadline – countering the story put forth by Poile and his associates. “The league source indicated Vesey’s representatives were surprised by Poile’s comments,” wrote MacDonald. As that story goes, something did change. Vesey decided to test the waters and have a choice at where to sign. Maybe he’d like to join his brother and father in the Maple Leafs system. Maybe it’s about playing for the Bruins, a team he grew up dreaming he’d play for. Regardless of where he signs, the Predators can’t dwell on what could’ve been. The fact is, the Preds do have the right to try to woo the pending free agent until August 15. In fact, they’re the only team that can work on a contract with the collegiate star until that time. And if reports are right, Poile and Fenton plan on grinding it out and trying to sign Vesey prior to the mid-August deadline. At this point, nothing is set in stone, but the Boston Herald is reporting that Vesey intends to sign with the Bruins when he becomes a free agent in August. If these reports do have merit and Vesey chooses not to sign with Nashville, Poile and the Preds will have to find a way to moving on. After all, as THN’s Kennedy says, it’s all part of the not-so-pretty business that is the NHL.